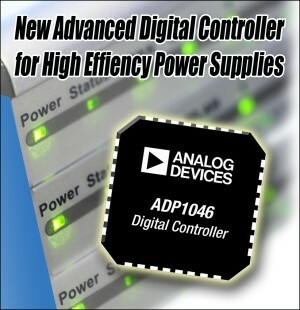 Analog Devices, Inc. introduced the ADP1046 digital power controller for high efficiency AC-to-DC and isolated DC-to-DC power supply systems. The ADP1046 is a flexible controller with seven PWM (pulse width modulation) logic outputs that can be easily programmed using an easy-to-use graphic user interface (GUI) with I2C interface. The device can be used to control and drive most power supply topologies including resonant mode for high efficiency. The ADP1046 is pin compatible with ADI’s award winning, ADP1043A but offers advanced features and greater flexibility, including voltage feed-forward for fast line transient response; dedicated control loop configuration to improve loop response and reduce output noise; and adaptive dead-time control for enhanced efficiency across the entire load range. The ADP1046 is specifically designed for high efficiency AC-to-DC power supplies used in server, storage and networking applications and isolated DC-to-DC supplies including intermediate bus and radio power amplifier applications. The ADP1046 power controller is easily programmed using an intuitive graphical-user interface which enables customers to design and optimize robust systems without the complex code programming required by alternative DSP (digital signal processor) based devices. The I2C interface allows read-back of key parametric data and enables extensive programmability of operation and fault handling. Based on Analog Devices’ precision, high speed A/D converter technology, the ADP1046 is suited to parallel and redundant power supply operation and offers analog and digital current sharing functions and control of the external OR-FET for redundant power supply applications. Flexible, easy to use, digital controller for high efficiency AC-to-DC and isolated DC-to-DC power supply systems. GUI programmability promotes ease of use and reduces time to market. Digital control loop with seven logic PWM logic signals to drive most power supply topologies including resonant mode for high efficiency. Voltage feed-forward improves line transient response. Dedicated loop filters for soft start, light load and normal load offer improved. loop response and enhance design flexibility. Adaptive dead-time control for improved efficiency across the entire load range. Current share and OR-ing control for use in parallel and redundant systems. User accessible 8K byte EEPROM. I2C interface allows extensive programming and telemetry. The ADP1046 digital controller is designed to complement the high-speed MOSFET drivers and ADI’s iCoupler digital isolators in isolated power systems, and the ADP1047 and ADP1048 power factor correction digital controllers in AC-to-DC systems. These devices facilitate easy implementation of intelligent power management for greater energy efficiency. The evaluation board features an isolated full bridge topology operating at 100KHz switching frequency. Its output is rated at deliver 12V, 9A with an input ranging from 36-60VDC. The board features the ADP1046 digital controller as the main controller for providing various functions such as current PWMs and OrFET control. It also provides protection features like OCP and OVP.